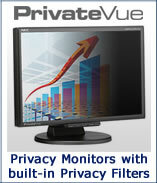 Want to have privacy filters installed on your own monitors? No problem! We provide the filter and integration services, you provide the monitors! Just choose the size of the monitor you are providing below and we will email you instructions for getting the monitors to us.